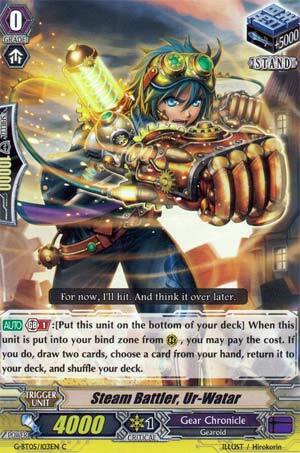 [AUTO] Generation Break 1:[Put this card on the bottom of your deck] When this unit is put into your bind zone from (RC), you may pay the cost. If you do, draw two cards, choose a card from your hand, return it to your deck, and shuffle your deck. And then Chronojet Time Leap made a lot more sense. The only reason I didn't bill this strategy higher first time was quite simple. I forgot this and Melem existed. Well so much for my professional integrity, but never mind. Ignore everything I said about Time Leap sucking. Ur-watar's skill activates on GB1 when he's sent to the Bind Zone from rear-guard circle, so basically when he's the target for Time Leap. He goes to the bottom of the deck, then you draw 2 cards, and shuffle a card in your hand back to the deck. So if you were to use this with any other Grade 1, you would be down a card for a +0 wash. With Melem however, you attack with her, send her back to deck to get Ur-Watar back, then you Time Leap him back into Melem - you get the idea. Multi-attacks on top of drawing more cards. And best of all, as the Time Leapt card keeps vanishing on you after attacking, you don't lose a card afterwards. Without Melem, this wouldn't hold up as a +0 wash. Melem is the reason this works. Don't max, hell no, you don't need to when he can be searched (Raphanna and Melem, for example), but use 2 in case one is lost to damage for whatever reason. This card is one of the most obvious efforts of Bushi to get people to run Stand Triggers by loading massive utility into them. Even people on the 12 crit life could not at any point deny that Ur-watar needed to be fit in any Time Leap build. Ur-Watar is Melem's partner in crime, because you're just gonna call time leap Ur-Watar after Melem called him to get your Melem back. You can even get a better suited Grade 1 depending on your situation. You get the chance to fix up your hand a bit when his effect triggers. You easily set up for his shenanigans using your G-Guard, Raphanna. Run bare minimum 2 in Chronojet and Chronofang. Eat cards out of your opponent's hands. Combo them to death. Who needs Novas, anyway?